The Art Loeb Trail is one of the most challenging yet most rewarding backpacking hikes in Haywood County. 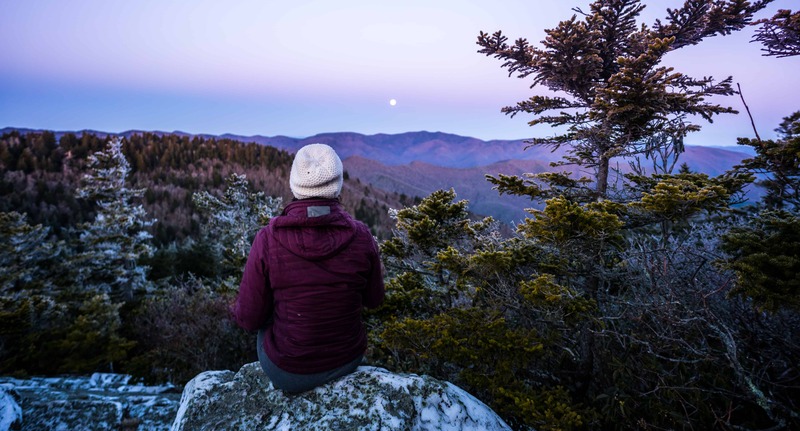 You will explore the wonders of the Pisgah National Forest, the Great Balsam Mountains, and the stunning Shining Rock Wilderness. Known for steep climbs, rocky sections, and long stretches with no blazes, it can be confusing for a beginner hiker, and rough for those with bad knees, so take caution when choosing this trail for your next 2-4 day backpacking adventure. Shorter hikes are listed below as well. Traversing beautiful and rugged terrain, the trail stretches between the Daniel Boone Boy Scout Camp and the Davidson River Campground. Most choose to hike the trail North to South from Camp Daniel Boone to Davidson River due to the steepest climbs being at the beginning rather than the end. The entire trail is marked with white rectangular blazes and brown trail markers at some intersections. When planning your trip make sure to pick up a Pisgah District Ranger map for sale at our Visitor Center or any local outdoor retailer. 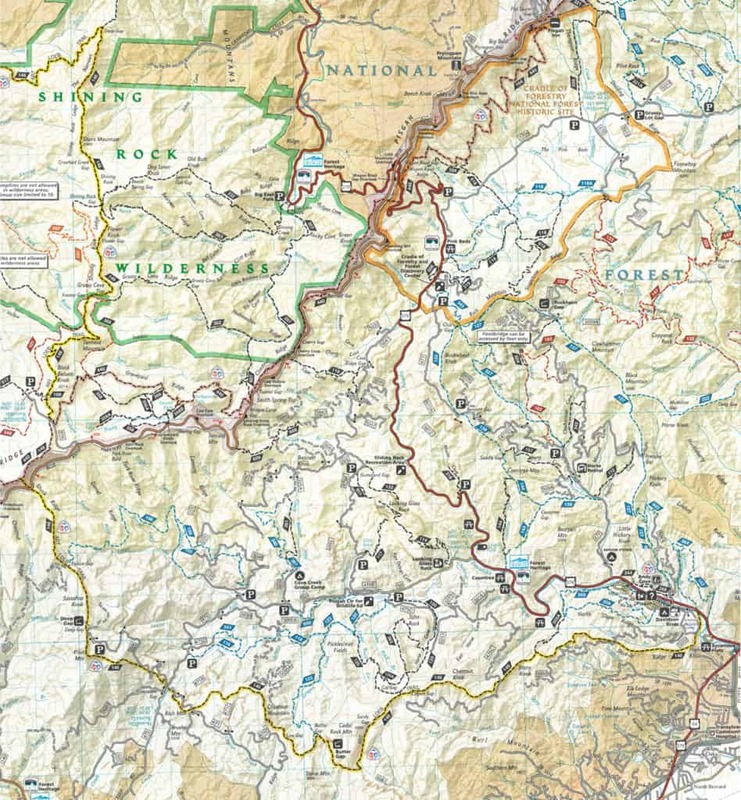 The Art Loeb Trail (ALT) Pocket Profile Map is another great map to show the elevations of summits and gaps as well as water sources on the trail. Hammock camping can also easily be done along this route due to the abundance of trees. The Shining Rock Wilderness section can be particularly confusing due to multi forking trails and large distances covered in between the white blazes. If you haven’t seen a blaze in a while, head back to the last intersection to check other options. Usually you will find one a few feet in from a forking trail. The Pisgah National Forest divides the Art Loeb Trail into four sections (we’ve rearranged them to coordinate with starting at Camp Daniel Boone). Short but steep ascent that leads to the Cold Mountain Trail to the left (the highest mountain in the Shining Rock Wilderness) and continues the Art Loeb to the right. There are no signs or blazes along this stretch of trail. This section weaves through the slanting ridges of Stairs Mountain and crosses several balds including Shining Rock. There are several campsites prior to Shining Rock. Take time to explore this area of large white boulders. Leaving the Shining Rock Wilderness at the open intersection find the Art Loeb trail on the second left trail and continue on to Tennent Mountain and Black Balsam Knob. From Black Balsam Knob you will cross over FS Road 816 to continue down the trail merged with the Mountains to Sea Trail. Leaving the MST the trail leads down a series of steep switchbacks to the Deep Gap shelter. Ascend Pilot Mountain before a long and steep decent on the front side leading to Gloucester Gap. Starting from Gloucester Gap the trail traverses about 5 summits and includes a shelter at Butter Gap while circling around Cedar Rock Mountain, and eventually reaches Davidson River with a 1/2 mile flat end to the Art Loeb parking lot. Fun Fact – ultra runners will run the entire 30 miles in a day. Cold Springs Gap – if you begin at Camp Daniel Boone you most likely you will not need to fill up here yet. Shining Rock Gap – about 100 yards past the gap with steps down to the source. Black Balsam – there are streams available both before and after campsites around Black Balsam. Deep Gap – right below the first shelter. Glouster Gap – (hiking from Camp Daniel Boone) take a left on the dirt road about 250 yards to find a piped spring. Butter Gap – piped spring by the shelter. There are several creeks on the way down to Davidson River if you need a final fill up on your last day. There are several out and back options available on the Art Loeb Trail parking at Davidson River, Camp Daniel Boone, Shining Rock Wilderness, on the Blue Ridge Parkway or at the Black Balsam Trailhead. Some options to get your started are Cold Mountain (10.6mi), Black Balsam Art Loeb Loop (5mi), or Flat Laurel Creek to Sam Knob (9.5mi). You can either leave a car at both ends or hire a shuttle like Leap Frog Tours to return you to your start car or drop you off at the trailhead. It is more advised to leave a car at the Davidson River Campground as there is more available parking there. To get to Davidson River go 0.2 mile south of Pisgah District Ranger Station on U.S. Highway 276, and turn onto the road to Davidson River Campground. Park in the Art Loeb Trailhead parking lot. The trailhead is located at Camp Daniel Boone, located off NC 215 (Lake Logan Road).